How about some baby crocs? Packed closely in a bunch, the tender, half-curled fronds of mogurjabba live up to their name by giving the fern the appearance of a group of baby crocodiles merrily tangled up. In the language of the tribals in Maharashtra’s Gadchiroli district, mogur means crocodile and jabba means green vegetable. Called Diplazium esculentum in scientific lingo, the fern is a welcome green addition to the diet of the Madia tribals in the Aboojhmaad area in Bhamragad taluka. Being hunter-gatherers, their diet mostly consists of fresh and dried meat, small fish, crabs, minor millets, odd delicacies like ants’ eggs or moth larvae, and, in recent years, rice provided through the government’s public distribution system. In summer months, when most of the wild vegetables, fruits and roots savoured by the Madias are no longer available, mogurjabba continues to grow in plenty along the numerous perennial streams, providing a rich source of vital nutrients. Wash the greens and pull apart the fronds into small pieces using fingertips or a strip of bamboo. The Madias caution against chopping the fronds with a knife or tear them using fingernails. Though they fail to explain the reason, this could be because any bruise makes the delicate fronds soggy. To prevent mogurjabba from burning, cook it in a heavy-bottomed pan by sprinkling a little water over it. Add salt. Cover the vessel and allow the greens to steam for six to eight minutes on a low flame till it becomes soft. Heat oil in a separate pan and add dry red chillies to it. A minute later add chopped tomatoes and garlic and stir for a minute or two. Add the steamed greens. A pinch of turmeric may be added if desired. Cook for a few minutes. Be careful not to overdo the already steamed leaves. Serve with rice. 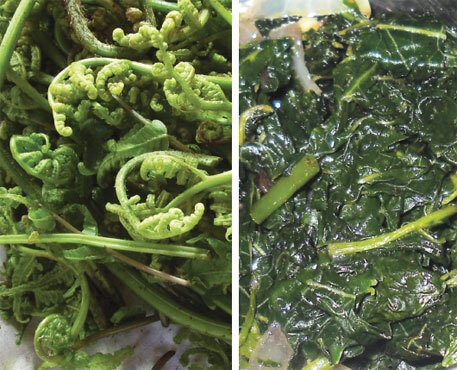 Research indicates the fern is rich in protein, iron, calcium and potassium. It is also consumed in north-east India and mandarin-speaking countries. Traditionally, Madia cuisine is minimalistic, consisting mostly of boiled and roasted foods. Condiments and oil are kept minimum and salt is a precious commodity. The most important taste-enhancer is tamarind, which is added liberally to meat and other non-vegetarian dishes that are not easy to digest. However, practices differ. The use of oil, chilly, turmeric and other spices has increased among those who have been exposed to modern lifestyle. Lalsu Nagoti, the first law graduate among the Madias of Maharashtra and a forest rights and natural resource management activist in Bhamragad, says mogurjabba is usually eaten boiled or lightly roasted in a packet of cow foot leaves, with varying proportions of oil and spices. Dali, a young woman from Binagunda village, who gathered a bunch of the greens for this correspondent, says it is also eaten raw, though in small quantities. The raw frond is crunchy and has a pleasant, sweetish taste. That night, in village Lahiri, downhill from Aboojhmaad, Lakshmikant Bogami, one of the very few elected representatives from the community, cooked mogurjabba for this correspondent. It looked very much like any other greens, but tasted fleshy, crispy and had a rich flavour (see recipe). Her recipe was simple but not traditional. When asked about an authentic Madia recipe, Nagoti said it is difficult to find one. The Madias are shy of revealing their traditional eating habits to “outsiders” for fear of ridicule. “It never occurs to them that their own food might be interesting,” he added. The same fern is also used extensively in several hill areas in north and north-east India. In Arunachal Pradesh and Assam, it is called Dhekia Saag while in Himachal Pradesh, it is called Lingadi. North-east people prefer it boiled or with little spices. Himachal Pradesh also prepares a wonderful achaar out of it. This is one of the most favourite green vegetables found in the local vegetable markets of Assam, Bangladesh, and North Bengal. At least in recent times, everyone -irrespective of their class background- prepares this. Locally known as 'dhekia', it is eaten in various ways- both vegetarian and non-vegetarian preparations. It is grown wild in various places: floodplain, home garden and roadside. Kachu- Dhekia (Yam- Fern) regularly appear in the Assamese literary works! Interesting read for a very interesting wild edible across many Himalayan and other states...Arupjyoti and Nivedita you make also like to have alook to the following link...on Diplazium...!! This fern shown in the photo can be easily find here in Malaysia. We call it "dragon's mustache" :D 1 of myy favorite vege!